Look Years Younger- Without Surgery? Have you ever wondered if it was possible to look years younger without undergoing surgery? For decades, dermatologists and their patients have sought a medical procedure that could lift skin without entailing all of the risks associated with a major surgery. Now that procedure has arrived in the form of Ultherapy ®. Ultherapy is a revolutionary skin tightening procedure. Many people who have tried it say that it’s the best way to look younger short of having a surgical facelift. If you want to gaze into the mirror and find that you are looking younger than you have in years, then you’ll want to consult with Soine Dermatology & Aesthetics today to learn more about Ultherapy in Covington. This non-invasive procedure is essentially a nonsurgical facelift. It relies on cutting-edge ultrasound technology to stimulate collagen growth beneath the surface of your skin. Over time, you’ll notice that you look years younger, and all thanks to Ultherapy. The Food and Drug Administration has approved this revolutionary skin tightening procedure for use on the forehead, under the chin and along the length of the neck. It can also be used on your decolletage to give your chest a more youthful appearance. You’ll have no reason to feel self-conscious when wearing that dress with the deep V-neck anymore! When you undergo this procedure, ultrasound energy will be targeted beneath the surface of your skin. This energy achieves an optimal temperature that is perfect for stimulating the production of collagen. Accordingly, you won’t be injected with any foreign substances nor will any incisions be made. This is definitely a noninvasive method through which you can look younger. Ultherapy is completely safe. The FDA has approved its use on various parts of the face, neck and chest, and it’s already proved to be a safe and effective treatment for hundreds of thousands of people in all corners of the world. You won’t have to worry about facing needles or having toxins injected into your skin with this skin tightening method. Instead, the technology simply stimulates the natural production of collagen beneath the skin’s surface. The result is firmer, plumper skin that looks more radiant and youthful than ever. You really can look years younger thanks to this skin tightening procedure. The real magic happens over the next three to six months. It takes that amount of time for your collagen to fully regenerate to the point that it can lift skin on the surface. This means that the results appear completely natural. Your friends won’t know what you did unless you tell them. They’ll only see that you look years younger, and they’ll wonder what kind of miracle product you’ve been using. 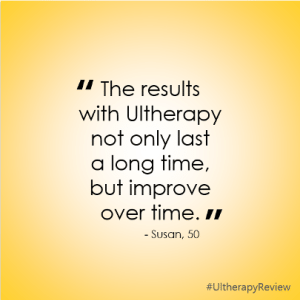 Ultherapy is like a nonsurgical facelift. Accordingly, you won’t have to worry about general anesthesia or confront your fear of knives. Your dermatologist cleanses the areas to be treated before applying the ultrasound gel. Then, using the ultrasound applicator, your doctor will determine the best place for application for achieving optimal results. The applicator then begins to send tiny pulses of energy deep into your skin to stimulate the growth of collagen. You may feel the pulses as they enter your skin. For most people, this is not an uncomfortable sensation. The treatment may last anywhere from 30 to 90 minutes depending upon the area or areas that are being treated. Afterward, you are free to go. No downtime is required, and most people return to their normal daily activities the same day or the next*. It’s likely that no one will know that you had this procedure performed unless you choose to tell them. The secret to looking younger is all yours if that’s the way you want it. If you’d like to know more about this innovative skin tightening procedure, then you only have to schedule an appointment with Soine Dermatology & Aesthetics. Dr. Soine will meet with you personally to discuss the possibilities for looking younger than you thought was possible. Your skin will be examined and Dr. Soine will ask some questions to ensure that you are a good candidate for the procedure. People with mild to moderate tissue laxity tend to see the best results. 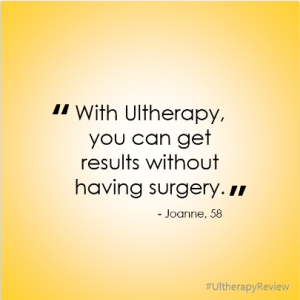 Remember, Ultherapy is like a nonsurgical facelift but it does not duplicate the results of surgery. It can extend the life of a previous surgical facelift or represent a great option for someone who’s just not ready for an invasive surgery yet. If you are looking for a treatment that will lift skin and leave you feeling and looking younger than you have in years, then Ultherapy may be for you. Patients often see amazing results like tighter skin and fewer sags and wrinkles. This nonsurgical facelift requires no downtime, and it’s likely that no one will ever know you had the treatment performed unless you decide to tell them. Make an appointment with Soine Dermatology & Aesthetics today to learn about how Ultherapy can help you look years younger in about an hour. View Real Ultherapy ® Before and After Photos*!